After purchasing this deal, you will need to visit the website listed on your Groupon voucher to complete redemption. If you are a solo participant or an odd numbered group, call (858) 454-6195 for scheduling assistance. 2 Hour Kayak and Snorkel Tour - 9:20 am - Everyday of the week. (Must be a comfortable swimmer in order to participate). Must sign waiver. Limit 1 per person, may buy 2 additional as gifts. Valid only for option purchased. 6 Max per group. Not valid May 27th - 29th, July 3rd - 5th, and September 2nd - 4th. Tours may not always go inside caves; subject to weather and safety. 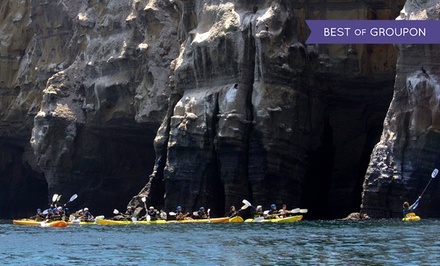 Kayak and Snorkel Tour does not snorkel inside the sea caves. Two week advanced reservation is highly recommended. Merchant's standard cancellation policy applies (any fees not to exceed Groupon price). Please, refer to website for times listed prior to setting reservation. 10% city tax and gratuity not included.